Thread: Total Newbie looking to get into a machine. I'm a complete newbie wanting to get into the next level in coffee at home. I currently have a Bialetti stovetop as well as a cheap-o Pod Machine, I kind of alternate between the two but I want to get into a proper machine. Any ideas for a relatively affordable setup that would allow me to get into the next level? Am I going to even be able to get close to a Machine + Grinder in the $500-$600 range? As I said, I'm a total newbie so any suggestions would be appreciated! 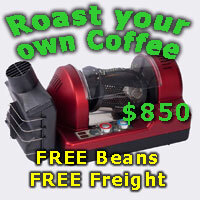 Hey Mitch, you could look into getting a new sunbeam 6910 that comes with a grinder. Many snobs used this as their entry level machine. Loved mine but upgraditis kicked in after a few years. Only down fall is it's an appliance that could start to have issues after a few years. Or you could save for a little longer and snag a breville bes920. Which coffee drinks do you want to make? How many at a time? Mainly latte's, however, I don't mind a few espressos every now and then. Mainly me, so only 1 at a time really.